Balazs Horanyi is an engineer and data scientist at Stream. Companies like Netflix and Pinterest have tackled this issue and pioneered personalization for their audiences. Through strategic integration of content and product recommendations systems, these two digital powerhouses have seen measurable ROI. Netflix says that its personalization platform saves the company more than $1B annually, and Pinterest estimates that more than 40 percent of user engagement is powered by its Related Pins recommender systems. So what about the rest of us, who don’t have the same kinds of resources? Can we do recommender systems too? Yes, and here’s how. Read on to learn how two commonly used algorithms – matrix factorization and a bipartite graph—can be used to deliver personalization in an application. Perhaps the most common type of recommender system algorithm is matrix factorization. The idea behind matrix factorization is to break a user-item feature matrix into a product of matrices, which end up becoming “user latent” features and “item latent” features. Latent features are hidden features that are derived from observed features using matrix factorization. In the above image, matrix A is a sparse matrix filled with user to item ratings. Ratings can take the form of explicit feedback (thumbs up or thumbs down) or implicit feedback (clicks or view time). One important thing to keep in mind is that it is usually a good idea to add user and item biases to take into account the popularity of items and discretion of users. For instance, some users are more liberal with their ratings and some items are just more popular. Now, we can multiply a user feature vector with the corresponding item feature vector to guess what that user may think of that item. There are many nice features that matrix factorization provides. In addition to allowing us to predict what a user may think of another item, the latent feature vectors of the items and users also allow us to compute similarity between other items and users. Let’s take a look at how Netflix could use something like this. A typical Netflix customer loses interest after perhaps 60 to 90 seconds of browsing. Out of thousands of choices, Netflix needs to show the customer something of interest after viewing between 10 and 20 titles, or risk the customer getting bored and churning. So how does Netflix do that? Netflix has something called the Personalized Video Ranker (PVR). As anyone who uses Netflix knows, there are several different styles of recommendations it shows you (broken out by rows). Let’s take a look at how Netflix could use matrix factorization to populate the Because You Watched and Top Picks rows. The Because You Watched row is based on video-video similarity. It’s a good thing we just found a way to compute item similarity through item latent feature vectors. Let’s pretend that Netflix’s database is made up of the MovieLens 100k dataset, and create a quick code example to show how item similarities could be used using the awesome library LightFM. # star ratings are treated as positive. You can see that the movie most similar to “Toy Story” is “Toy Story,” and the one most similar to “GoldenEye” is “GoldenEye,” which is a nice sanity check that things are working properly (whew). The rest of the list for these two movies seems pretty relevant. This is good news considering we didn’t have to know anything about the content of these movies, just the interactions that people had with them. Now let’s look into making our Top Picks. By computing all predicted ratings for each movie for an individual user, one can easily take the top X movies and present it in a row. LightFM has plenty of good examples showing this. One thing that isn’t abundantly clear is what to do when you have a new user (bummer). In this situation we can’t use standard matrix factorization because we haven’t collected any information about that user’s preferences. One way to get around this is to suggest the most popular content on the page until we can provide more personalized recommendations. The item biases we calculated can assist in this process. 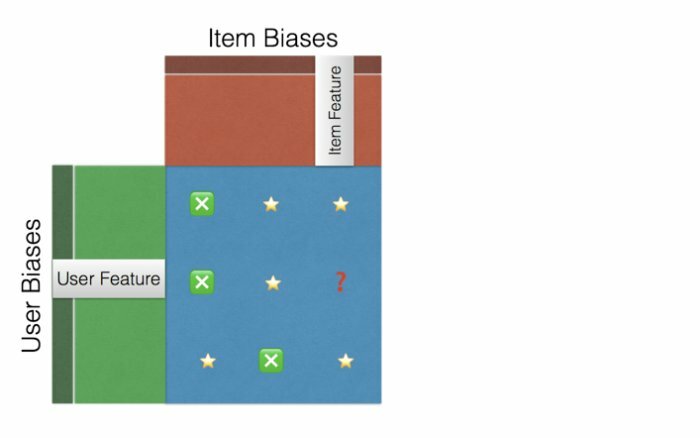 The model we trained above automatically calculated item biases for us. These item biases not only normalize the feature vectors, but also can show us what the most popular movies are. I’d say those are some pretty darn good movies! One issue that many larger companies run into is sparsity of the user-item matrix. For example, Pinterest has to power recommendations for 100 billion ideas for 150 million people (yikes), so can expect sparse data for a significant number of users. One way to tackle this problem is to break the recommendation engine into two parts: candidate generation and personalization. By using graph algorithms to provide 1000 candidates out of billions, it is possible to provide recommendations even when there’s extreme sparsity in the data. Pinterest’s goal is to be a visual discovery engine for the Internet. As noted earlier, its Related Pins recommender system drives more than 40 percent of user engagement. However, trying to stuff that into a user-item matrix would cause a whole host of problems. 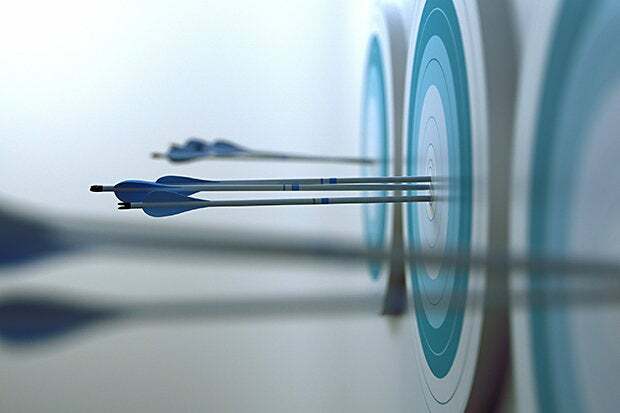 Pinterest has a two-step method to generate relevant content: Use a candidate generation system called Pixie to generate around a 1000 relevant pins, and then further utilize machine learning to do ranking before presenting the pins to the user. Now when a user pins an item to one of his or her boards it is possible to start a random walk with reset at the specific pin. 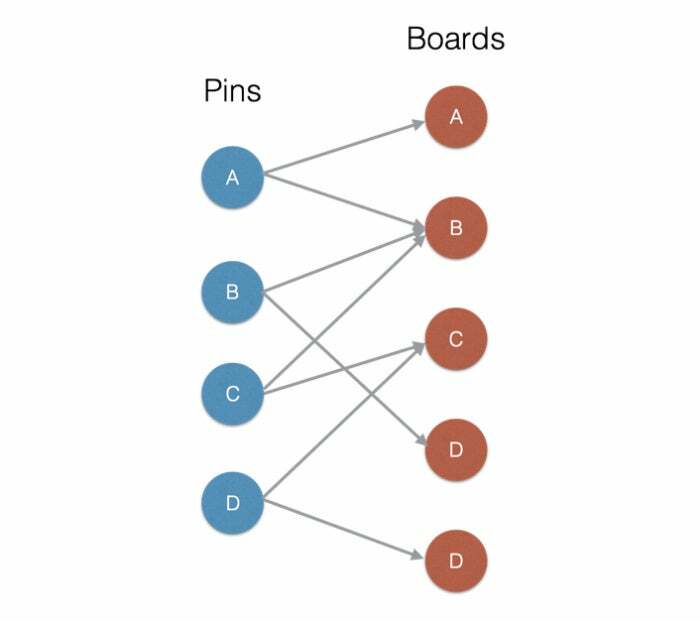 By taking two steps, one from pin to board, and another from board to pin, and repeating, it is possible to count the number of times each pin was hit and see how relevant it is. This ends up being a very general model that can be used for lots of recommendation types. Twitter’s Who To Follow algorithm [PDF] works similarly for suggesting follow recommendations. The same algorithm could also be used for movie recommendations, product recommendations, or basically anything that can be broken out into two sets of nodes and made into a bipartite graph. You can read about more applications for graph algorithms in this blogpost. So while not easy, it is possible to create optimal digital consumption nirvana (see, it’s catching on) for your users through personalization and machine learning. Matrix factorization and graph algorithms are two excellent places to start. Stream engineer and data scientist Balazs Horanyi has always had a love of data, math, and programming. At Stream, he primarily focuses on personalizing feeds and application engagement using machine learning.